Scott’s focus is to support the creation of climate action pathways, that integrate governance and accelerate the subnational implementation of GHG emission reduction goals. New institutional arrangements and technical capacity for carbon management at the subnational level reduces the asymmetry of information, improves transparency across levels of governance, accelerates investments in clean energy and green infrastructure, and can improve social equity. This can also raise ambitions on NDCs and long-term low emission development strategies. Scott is passionate about implementation. In his 20 years of strategy work, he has led a range of early-mover initiatives with national & subnational governments, international organizations, indigenous groups and the private sector on urban sustainability, ecosystem services and harnessing green growth opportunities. From 2007-2012, Scott directed the Clinton Climate Initiative (CCI) and C40 Cities Climate Leadership Group in Lima, Peru. In close collaboration with the Mayor and City Council, they were able to achieve significant policy advances and launch new infrastructure projects that delivered massive emission reductions with short ROIs and critically important co-benefits. In addition to his extensive field work across the cities and forests of Latin America and Asia, Scott has been appointed as a technical expert with the UNFCCC, UNESCO, and the Secretariat of the Convention on Biological Diversity. 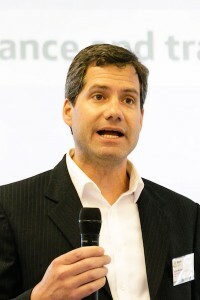 He has also served as a national delegate for various multilateral environmental conventions and has published many key global reports, including; collaborating as a lead author on the UN-supported Millennium Ecosystem Assessment, the CBD Guidelines on Biodiversity and Tourism development, and UNFCCC technical papers on options to enhance pre-2020 mitigation ambitions in urban environments and land use. Currently, Scott chairs the global working group on Subnational Integration and Multi-level Governance of the LEDS Global Partnership.